Page 2 is our community page, open to anyone with something interesting to say on local transit or land use issues. Posts are not reviewed or vetted by STB staff. Sign up if you’d like to contribute, or add a new post. Seattle Gondola Network; it links major N/S routes south of city center. Overall length: 7.1mi, 8 stations. At Gondola Project‘s estimate of $24m/km, that comes to $275 million. Do you have a link to that map? The map graphic is at https://i.imgur.com/G6sfFqN.png . There’s probably an easier way to do that! Cool. That is better, although I prefer maps that are more dynamic. For example, a line drawn on a Google map. That way, i can easily zoom in on a particular spot, or back again. When looking at that image, I want to drag it down, so I can see what is to the north (or the opposite). That being said, simply listing the stops is sufficient. As with just about any system, it is all about the stops. Fauntleroy Ferry — Doesn’t look great to me. The ferry serves suburban and recreational areas (unlike Bremerton). Since the gondola doesn’t serve a major (or even minor) employment center, I don’t think there would be much ridership. There just won’t be many who want to commute to South Seattle College from Vashon. You also don’t have that much of a speed advantage for that section. It might be popular from a recreational standpoint, but that isn’t a high priority to me. 35th and Morgan — Excellent location. One of (if not the) most densely populated spots in West Seattle. It also works well as a connection spot (for buses traveling on 35th). Delridge and Findlay — Not very high density, but it does connect to Delridge, which is probably worth the extra stop. SSCC — The key stop on your route (and my alma mater). 4th and Orcas — Personally I would rather connect the two SSCC campuses, but there may be a physical reason why you chose this. Beacon and Brandon — A relatively low density area. I wonder if you could go north a bit, and get close to the V. A. It is also low density, but has a fair number of jobs. Columbia City — Great location. Genessee and 50th — A low density area. It has a bus route, but that bus also serves Columbia City. So I guess I would trim the project on both ends, and move the middle stations a bit to serve the other SSCC campus and the V. A. But like any transit project, the key is the cost. We would need to balance the cost with the value. Anyway, as far as particulars go, I think the big challenge in Seattle is for gondolas to be treated seriously. There are particular places in Seattle where they would make a lot of sense, but you would have to do a real study to figure out how expensive it is to build. It isn’t the cable, it is the land needed for the towers. 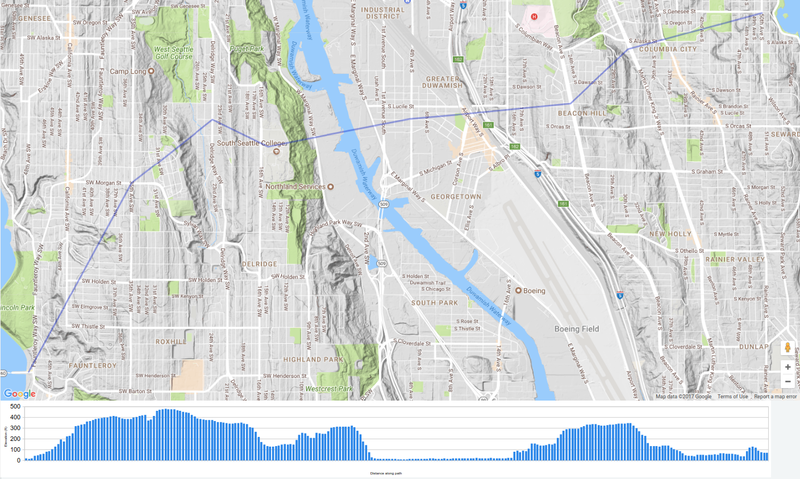 For example, the route that comes up a lot is Capitol Hill to South Lake Union to the Seattle Center. This is very high density (for Seattle) and overcomes one of the big obstacles in the region (I-5). The distance is short enough, and difficult enough by other means to be just right for a gondola. But it wouldn’t necessarily be cheap. Perhaps the answer is not to come up with various ideas (yet) but to call for a study. Ask SDOT (under a new administration) to spend a few million studying various possibilities, the way that the county studied passenger ferries. The end result might be the same (they just don’t pencil out) but at least we would have a good idea of the cost. That’s pretty close to the north end of Boeing Field; there are likely height restrictions in that area to keep clear the flight path for planes landing and taking off. Good point. The height restrictions are defined in SMC 23.64 (https://library.municode.com/wa/seattle/codes/municipal_code?nodeId=TIT23LAUSCO_SUBTITLE_IIILAUSRE_CH23.64AIHEOVDI_23.64.004BO) and in the most restricted zone structures can’t be over 37ft tall. It also looks like it’s going to have to cross the high power transmission lines somewhere on Beacon Hill. That’s not an impossible task but it will require either some really high wires or an underground pathway. I appreciate the specific and well-informed comments from Ross and others. As a newcomer here I am engaged by the challenge of learning to think like a transit planner. Fauntleroy – How does one find reliable detailed data about traffic? I see gross numbers (e.g. 100K foot passengers per quarter) on the WSF site http://www.wsdot.wa.gov/ferries/traffic_stats/ . If these are mostly weekday commuters, where are they going? Downtown commuters are probably taking the water taxi. If they are terminating outside of downtown perhaps they already have a two-seat ride and the gondola would speed it up? Delridge Way – There’s a comprehensive report on the Delridge Way corridor in connection with RR H (http://www.seattle.gov/Documents/Departments/SDOT/TransitProgram/RapidRide/2017_March_DelridgeWaySW_ExistingConditions_FINAL.pdf); the small commercial center at Findlay seems like a good target to me, being near the middle of the broken-street-grid section of North Delridge. SS College – How does one make reliable traffic estimates here? There are public enrollment numbers, and (I presume) boarding statistics from the 125 and 128. Would a gondola get a good fraction of the car commuters onto transit? What would happen to 125 ridership? Georgetown – This is a puzzle because of Gtown’s weird layout and lack of data about job density. The Orcas location connects to 131/132 on 4th, has some residential and employment walkshed, but it’s not particularly strong. Bringing the line down to the Carleton corner of the SSCC Gtown campus sounds synergistic for the college, but would the traffic pencil out? It pulls in a small residential walkshed and connects with the 60. It would probably require an aerial turn in the route to Beacon Hill in order to clear the airport restrictions. Getting close to the Airport Way commercial strip might be good for traffic but makes airport clearance even harder. Genesee & 50th – I agree with Ross here, it’s most likely superfluous. My biggest question as a dilettante citizen transit planner: where do you get real data? Is Metro per-stop traffic data posted publicly somewhere? The RR H report refers to “Longitudinal Employer-Household Dynamics (LEHD) data”, is this in a public citywide study? ETc., etc. I would love to see a consolidated web page pointing to transit planning data sources. If these [ferry riders] are mostly weekday commuters, where are they going? Downtown commuters are probably taking the water taxi. If they are terminating outside of downtown perhaps they already have a two-seat ride and the gondola would speed it up? There is no water taxi from Vashon. So my guess is a lot of people just take the ferry, then the bus to get to downtown Seattle. Someone from Southworth could drive over to Bremerton, and take the passenger ferry to downtown, but it is probably a lot easier to just take the ferry and then the bus. I agree, I think that would be better. You connect two of the high density areas in West Seattle (High Point and the Junction) with very frequent service (the 128 connects them right now, but only every half hour). Getting to SSCC is much easier as well, not only from the Junction, but from other places as well. From downtown, you just take the first bus that heads to West Seattle, and then transfer to the gondola (35th, Delridge or the Junction). That is arguably the best thing about a gondola. It isn’t especially fast, but the headways are measured in seconds, which means the transfer is painless. Given Seattle’s geography — where a grid is difficult in most of the city — you could make a very good argument for east-west gondolas and north-south buses. You still want to have decent destinations (otherwise you are just making transfers from two buses) but SSCC and the Junction are just that. As I said up above, if you could also include the V. A. and the Georgetown Campus of SSCC, then you could have a pretty decent little system. Very good question. I have struggled with that as well. Population data is fairly easy to find, although a bit out of date (I like this map — http://arcg.is/265DF67). But employment data is hard to find — I’ve asked, but never found it. I keep forgetting to ask folks about Metro ridership *per route*. The website has overall ridership, but I can’t find per route ridership, let alone per stop ridership. If I remember, I’ll try and ask that in the next “open thread”. More people read that thread, and hopefully someone knows how to dig up that data. Oh, and hopefully one of us remembers to ask about it. There is a Vashon-Downtown water taxi, which is presumably faster than a 2-seat ride on the C to downtown. I think it’s great that you’re thinking about cable-pulled technologies. They can be automated in the right circumstances, and that can reduce operating costs. They also are quieter and greener and cheaper than building and maintaining the additional electrical systems required for something like light rail. As for this specific proposal, I see a few issues in addition to some other ones discussed in the responses..
1. This appears to vault over residences. That’s going to pretty much make the conceputal alignment a non-starter politically. Any alignment will probably need to be over public land or ROW, or maybe non-residential land. 2. I don’t think that demand is high enough between these areas to warrant such a major investment generally. There are plenty of hillsides or barriers in Seattle that affect areas with higher activity as well as parking charges and challenges that could more benefit from a gondola or other cable-pulled system — like Downtown to First Hill/Harborview, Capitol Hill to SLU, 520/Montlake to UW, Burien to Tukwila International Blvd, U-District to University Village, South Bellevue Link to Factoria or Eastgate, Upper Queen Anne to Seattle Center Link, U-District to Fremont or Wallingford, Federal Way to Auburn, South Kirkland Link to Downtown Kirkland, Highline College to Kent, Northgate to Lake City, or Northgate to Northwest Hospital. 3. Top gondola speeds are reported at about 17 mph. That isn’t too bad for a mile or two, but it really is not attractive for longer distances if the car has to layover at each stop or if passengers have to keep switching cars to use the gondola line. Other cable-pulled systems like funiculars and the Oakland Airport people-mover can push up into the 30 mph range so that might be a more attractive technology for slightly longer trips. I sense your frustration with West Seattle connectivity. That is part of a wider discussion and conceptualization that is badly needed for Link when it opens around 2030.